RC Kamalakannan is the VFX producer of Magadheera. He explains us about the efforts went behind the making of Udayghad city and arena. What makes Magadheera different from other films? We know the story in the first 10mins but sat down till the end to watch the credits. That’s the strength of our Director SS.Rajamouli. Next comes Senthil’s camera work. Neat unrelenting professionalism. Next Ravi’s Art department. And then comes my Visual Effects. All should start on paper as concept drawing. But for Stadium, Marco Rolandi, an Italian concept artist, started as a cad-drawing. In 5 days he made his first 3d concept. It took five months for Marco to reach the following design as per the Director’s imagination. 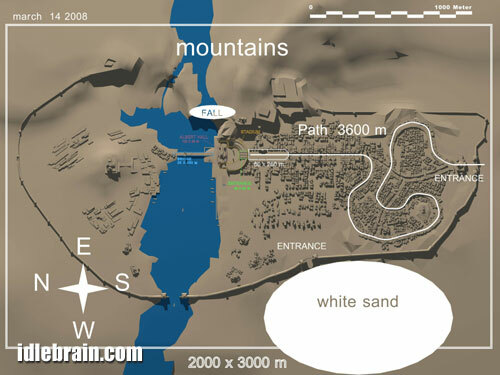 Simultaneously Adel Adili of Iran, 3d Technical Director of Magadheera, was working on the 3d Udaygadh city. Adel is a unique 3d artist. He was involved in Anji, Yamadonga, & Arundathi along with me. He started the Udayagiri City with a city-plan. Streets, buildings, mountains, temples, palaces, water bodies and its connections, huge waterfall, its sources, river, its streams, gate, moat, trees, all are perfectly planned, got SSR’s approval in stages, and was executed. All upto scale. Adel redesigned Marco’s 3D stadium to suit Indian Aesthetics and made it fit perfectly to the city. 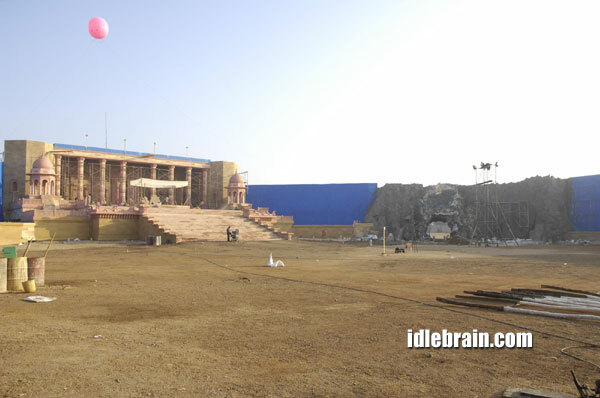 It’s Adel’s stadium that has given the visual grandeur of Magadheera. 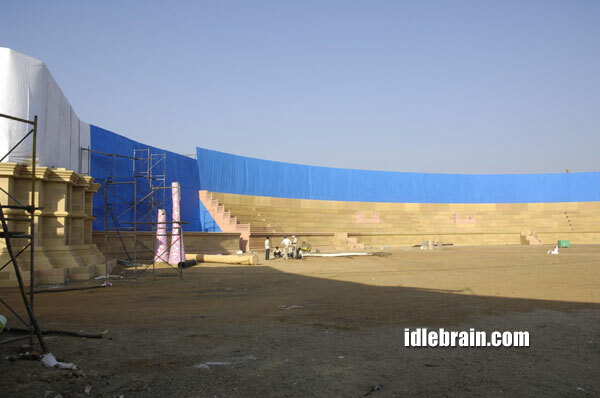 The part stadium-set, based on Adel’s design was erected under Art Director Ravi’s supervision at Ramoji Film City. Several technical difficulties were faced during the shoot. For example, the ground was uneven, especially near the King’s seating, steps were 2 ft higher than the ground near the entrance tower. This posed a major problem when we composited real & CG later. The Director came out with a simple solution based on the simple water level, which data we followed carefully till the end of the pipeline in post-production. In India, most 3d computer graphics are happening in 8-bit colour depth, which is much inferior to the colour depth of film negative. That’s why, when we composite live & CG, the CG looks separate from the live “plate”. The only way to do a perfect composite is to follow the same colour-bit depth of the film negative. It needs an experienced, dedicated team to do so. As the VFX producer of the film my job is to find suitable studio/freelancer to deliver utmost quality at proper budget on time. So, we brought in Mr.Pete Draper of UK as our Pipeline Technical Director. Pete had worked with me in Ghajini ( Hindi). His knowledge in Pipeline setup, Renderfarm setup, 3D Particle flows are impeccable. He had also penned many 3D technical books. With the right mix of theoretical & practical knowledge, Pete landed at Hyderabad during the Stadium shooting, which was happening under EFX Prasad’s supervision. I was in Iran during the schedule, finalising the CG stadium and City with Adel. 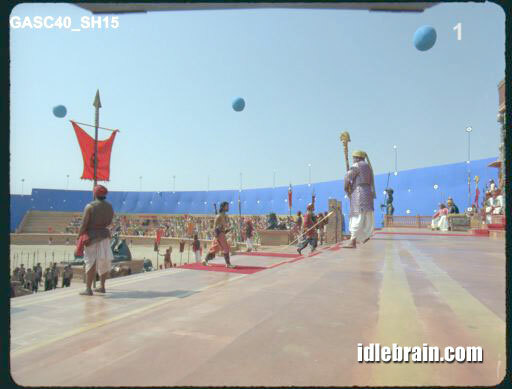 The major portion of the film was shot in Anamorphic but to minimise the distortion, super 35 camera gate & lenses were used for the stadium episode. The Post-Production of the stadium was given to Prasad EFX, Chennai, a well-known facility. Headed by Mr.Hima Kumar, it has rich experience and had the right people to do the final composite. The producer gave me enough encouragement ( and budget ) to set-up our own Renderfarm in Chennai. The Pipeline, Pete set up, for the post is the “heart” of the process. EFX was lucky to’ve got him as TD. They won’t go back to 8-bit comp ever. So a typical composite will have live layer, Stadium layer, 3d people layer, sky layer, flags layer, digital soldiers layer & birds layer. ( All in several 16-bit file passes.) Pete has designed the Birds (particles) in two flows, one “flow” kept on “flying” around the stadium and the other flow takes off from a position dome and lands on a target dome. Director had used the birds in several shots effectively. Also the huge balloons over the live set denote where the CG structure to be positioned later in post and served as a reference for the 3d lighting. It all went like clock work. On finishing stages of the stadium composite, I ventured to Iran again to work with Adel for the 3d city shots. The city-shots created entirely in CG. The shots where the two horses enter the city gates and the one fly-thru, which travels along the city and ends on top of the Lion’s wings are treat to watch. When we started the city-shot renders, it has taken several hours to render one frame. But Adel re-corrected the geometry and applied several path breaking ideas, so, even on 24th July, just a week before the film release, we were able to do corrections, render and submit. Adel designed the 3d horses with hero & villain and Pete designed the 3d people flocking behind the horses. Perfect team work. Thankyou. What’s your future plan? In 20 years of my profession in CG, there was a time I looked up at VFX Venky’s films, esply he & Director Shankar’s combo, in awe. Starting Indian Artists & working with Directors like Murugadoss & producers like Shyam Prasad Reddy was a step ahead. Later, relinquishing Indian Artists and going freelance made me somewhat lack in confidence. Director SS.Rajamouli gave the confidence back by believing in me and my ideas. I’m forever grateful for it. Future plan, ofcourse, always better than the previous project(s).